Introducing solid foods to your little one is a huge milestone that lays the foundation for healthy eating habits. Rice and Oatmeal cereals are the least of the allergenic grains and thus most babies are started out with those cereals. You don’t HAVE to start with cereal – try avocado instead or banana. May be served raw after 8 months old or earlier if the fruits are soft and baby does not have digestion troubles – bananas and avocados do NOT need to be cooked ever. Always serve cooked until after 12 months old or when baby can chew well enough so that no choking hazard is present. NEVER replace breast milk or formula until after 12 months of age – serious health risks are possible. Never give a child under the age of 2yrs old low fat or skim milk products; whole milk is necessary. When thinking about starting baby on solid foods and introducing solids to baby, a good rule of thumb is to “Watch the Baby – Not the Calendar”. This is true when introducing solid foods (complementary foods) for both breastfed and formula fed infants. Just because baby has turned 4 months old does not mean she must be introduced to solid foods. How much will your 4 month – 6 month old baby eat at his first meal? Babies will probably only eat 1/2 of a tablespoon portion of food the very first times you begin solids. Don’t expect your baby to “finish” a meal; remember this is a new experience for your baby. As your baby gets older and is eating more solids, you will gradually increase the portion sizes. Also, keep in mind that breast milk and/or infant formula are providing for the total nutrition of your baby at this stage. Many parents find their babies will push the food out of their mouths on the first few tries. This is normal however it may also indicate that your baby is not yet ready for solid foods. 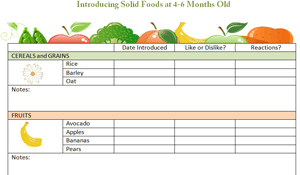 Only you know your baby and will be able to decide if baby is truly ready for solids. A baby’s tummy is the size of his fist – remember this as you are feeding him; it doesn’t take much food to make a “meal”! 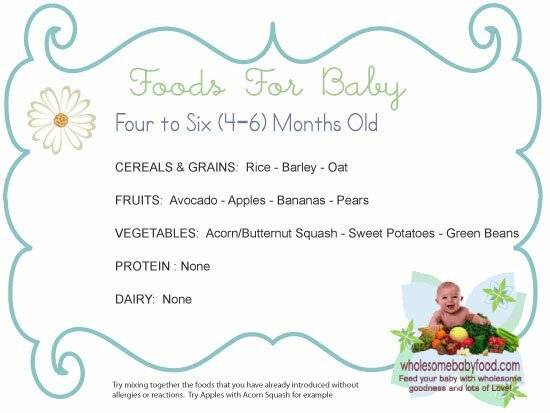 Download the new 4-6 month old food diary chart! Whole Cow Milk, as a drink, should not be introduced until 12 months of age. Learn about Introducing Yogurt and Feeding Cheese to your baby.